At ENS, we believe in providing a quality product at an affordable price. This is accomplished by gaining a full understanding of the wants and needs of our clients. We then provide our expertise and guidance to ensure consistent progress throughout the life of the project. The result is a professional design, that will strengthen your business. You have one chance of making a good first impression to your clients, why not make it GREAT! 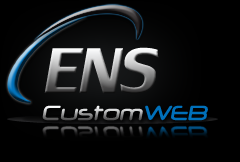 2009 © ENS CustomWeb, Inc.